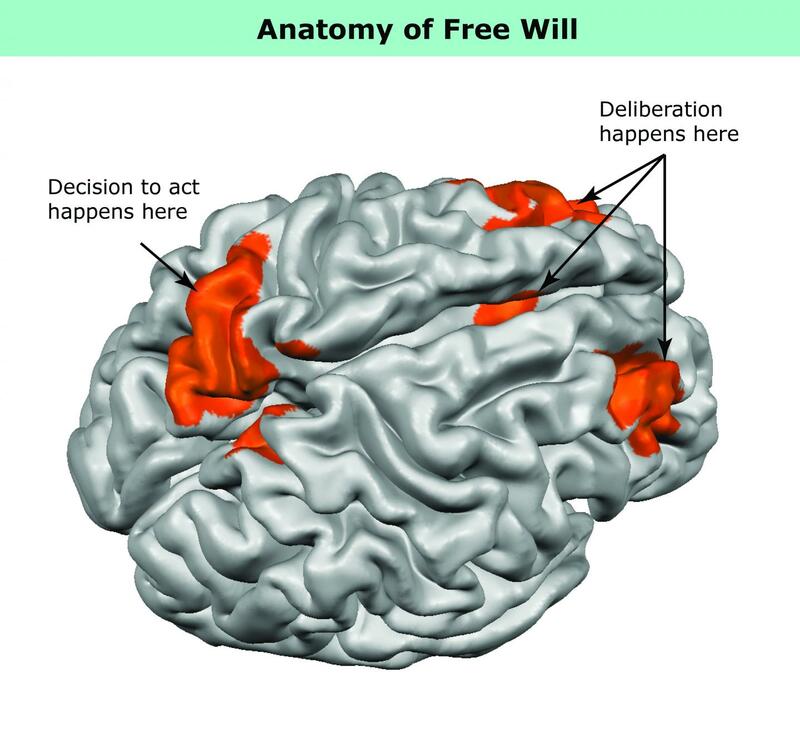 IMAGE: An illustration of the human brain indicates where researchers found activity relating to free-will decisions. Johns Hopkins University researchers are the first to glimpse the human brain making a purely voluntary decision to act. Unlike most brain studies where scientists watch as people respond to cues or commands, Johns Hopkins researchers found a way to observe people’s brain activity as they made choices entirely on their own. The findings, which pinpoint the parts of the brain involved in decision-making and action, are now online, and due to appear in a special October issue of the journal Attention, Perception, & Psychophysics. The team devised a novel experiment to track a person’s focus of attention without using intrusive cues or commands. Participants, positioned in MRI scanners, were left alone to watch a split screen as rapid streams of colorful numbers and letters scrolled past on each side. They were asked simply to pay attention to one side for a while, then to the other side — when to switch sides was entirely up to them. Over an hour, the participants switched their attention from one side to the other dozens of times. Researchers monitored the participants’ brains as they watched the media stream, both before and after they switched their focus. For the first time, researchers were able to see both what happens in a human brain the moment a free choice is made, and what happens during the lead-up to that decision — how the brain behaves during the deliberation over whether to act. The actual switching of attention from one side to the other was closely linked to activity in the parietal lobe, near the back of the brain. The activity leading up to the choice — that is, the period of deliberation — occurred in the frontal cortex, in areas involved in reasoning and movement, and in the basal ganglia, regions deep within the brain that are responsible for a variety of motor control functions including the ability to start an action. The frontal-lobe activity began earlier than it would have if participants had been told to shift attention, clearly demonstrating that the brain was preparing a purely voluntary action rather than merely following an order. Together, the two brain regions make up the core components underlying the will to act, the authors concluded. Now that scientists have a way to track choices made from free will, they can use the technique to determine what’s happening in the brain as people wrestle with other, more complex decisions. For instance, researchers could observe the brain as someone tried to decide between snacking on a doughnut or on an apple — watching as someone weighed short-term rewards against long-term rewards, and perhaps being able to pinpoint the tipping point between the two. “We now have the ability to learn more about how we make decisions in the real world,” Courtney said. The research team also included former Johns Hopkins doctoral students and postdoctoral fellows Yu-Chin Chiu, Michael S. Esterman, and Adam S. Greenberg. The paper is dedicated to the last author of the study, Steven Yantis, a professor in the Department of Psychological and Brain Sciences who died of cancer in 2014. This research was supported by National Institutes of Health grants T32EY07143, T32AG027668, F31-NS055664, R01-MH082957, and R01-DA013165.